Greek workers demand: tax the rich! Reinstate Arwyn now. Nothing less! Who are the Socialist Party? The left on 30 June: more "general nonsense"
Prentis promises a fight to win. Hold him to it. Single parents and children not welcome in the labour movement? Rich Greeks have 600 billion euros in Swiss bank accounts (Der Spiegel, 7 February 2011) — a stash more than enough to solve the debt crisis, and untouched by the government cuts. Yet now Greece has a new cuts plan — and a new movement against the cuts. Since 25 May, people have demonstrated almost continuously in Syntagma Square, in Athens, in front of the Greek parliament building, sometimes hundreds of thousands strong. A continuous “people's assembly” of “indignant citizens” is also running in front of the White Tower in Thessaloniki, Greece's second city. In a dispute which even sections of the mainstream press have described as “the UK’s Wisconsin”, local government workers in Southampton have been battering a cuts-happy Tory council with a programme of indefinite rolling strike action. Its creative strategies and levels of rank-and-file control over the dispute make it almost unique in recent UK labour movement history, an inspiring and significant departure from the usual one-day token efforts called from above by union leaderships. Union activists expect “the vast majority” of schools in Doncaster to close, as council employees in the public sector union Unison prepare to strike alongside teachers on 30 June. Unison is striking against budget cuts and job losses at the council and could take further action later in the summer. 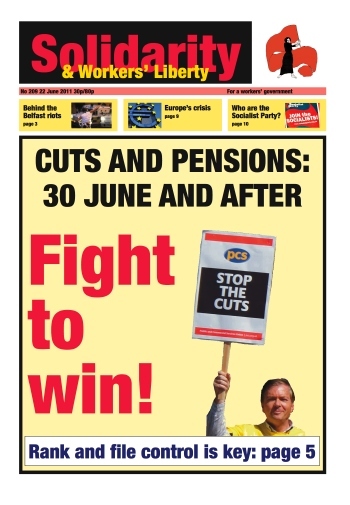 National Union of Journalists members working for south London titles of the Newsquest group will join strikes on 30 June as they begin a four-day walkout on 27 June. Despite the group continuing to make large profits (it made an operating profit of over £70 million in 2009), senior management have decided to make an as-yet unspecified number of editorial staff redundant. In most areas, Labour councillors have been implementing cuts. Not all can be tarred with the same brush. In north Essex the Labour Party has been the most vocal against cuts, in areas where there is not a trades council. Clacton Labour Party and the GMB union have been the driving force behind resurrecting the Tendring District Trades Council, which was formally set up in a meeting last week. Over 600 delegates attended the Unison local government conference (19-20 June) to plan the strategy for fighting the cuts on public services, jobs and pensions. Just 24 hours before conference started, General Secretary Dave Prentis announced that if the government refused to reverse pension reforms we would unite with others to see “biggest strike since 1926” and “unlike the miners' strike, this time we'll win”. The rules conference of the Unite union (13-16 June) took place against the backdrop of strikes planned for 30 June and with the newly elected “United Left” dominated Executive Council in place. Tony Woodhouse, chair of the Unite Exec, opened the conference by saying it is time to fight, and for socialist principles. General Secretary Len McCluskey followed in a similar vein, but added that we shouldn’t do anything to disrupt our good relations with the new Labour Party leader Ed Miliband. Update 22 June: The Employment Tribunal today found that London Underground dismissed Arwyn Thomas unfairly. The Employment Tribunal panel in the case of sacked Tube driver Arwyn Thomas convened a week earlier than expected to decide on its verdict. That suggests that there is significant pressure to see this dispute closed. The panel is now due to announce its decision on Wednesday 22 June, but as things stand the strike beginning on Monday 27 will go ahead because right now Arwyn does not have his job back. It's as simple as that. Peter Taaffe, leader of the Socialist Party (SP), has recently denounced the Alliance for Workers’ Liberty over Libya. We have replied, and challenged Taaffe to a debate (no formal reply yet). Who are the Socialist Party? Martin Thomas offers a briefing. The Socialist Party is a would-be Trotskyist group in Britain. Though smaller than the Socialist Workers Party (SWP), it prides itself on the number of places it has won on union Executives and on its electoral activity (for a while, it had a few local councillors, though it is now down to one).